very nice candid of your daughter Sasa, i like that she has plenty of space in front of her, you could maybe crop some behind her away though as it is dead space. I think the space around her works very well. It helps give the viewer the impression of where she has come from and where she is going. 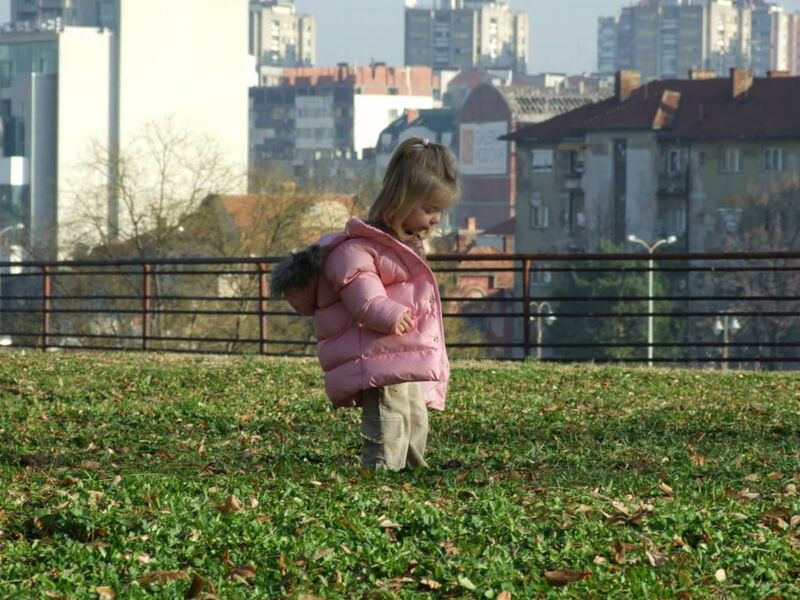 You can also get the feeling of a little girl in a big world from it. I like the simplicity of this. The dark 'vignette' gives the impression of spying in on her world. Thanks for sharing your cute little girl. She is beautiful! The only thing that bothers me about this is that she is in the centre of the photo. Sometimes it works but not so much in this case. Although the background is interesting you need to have a narrow DOF here so that it doesn't distract from your subject. I am not familiar with your camera. Do you have aperature control? You need a wide aperature/small f-stop number for example f/4 or less, depending on other facts and conditions of the shoot. and next time you're taking pictures shooting with a wider aperatue/ faster shutter speed will give you a shorter depth of field which would blur the background putting more focus on Dana and less on what's behind her. You should try it just to see how you like the results. Explore, try new things and if it doesn't turn out like you thought it would, try something else. In the end it's your opinion that matters. Sasa - I had a Fuji s7000 - very similar to your camera. So Emilie was saying try using the A setting on the camera at f2.8. Yes you nailed it on the crop. That looks much better with respect to composition. I haven't had a chance to look at your links but I think John answered that part for you. A fun thing to do to find out what your camera can do with aperature and DOF is to put items in a row and take several photos of the first object at different aperature to see what your camera does. It is interesting experiment because every camera is different. Sasa, Sorry if I caused offence - not intended, just trying to help. Dont worry about me, im not easy offencive. You're all free to place your opinions about my work! I'ts very important to me. I think the crop is an improvement but the picture is still very dark. I downloaded the pic and played with it a little. increased the "shadows", which brings up the black level and increases color saturation. sharpened the image and then did a soft focus centered on her face. Now having done all that I will admit it wouldn't be the first time I've un-done someone's hard work to make a picture look dark and muted. If that's the case, my apologies, but this is how I would optimize this particular picture. I have an S5100 and drooled over the S6000 when it was announced. Looks like a great camera on paper. How do you like it? I had to do this fairly quickly. I didn't do much. I cropped much like Sasa did. I lightened it a wee bit, it was a little dark for me too. I also sharpened Dana then took my sponge tool and under 15% saturate, painted over areas that I wanted the colour to pop. The first is the cropped original and the second my edit. You can even go further with the sponge tool before it starts to look too staturated. Laim is starting to wake up so I didn't take any further then this. But you get the idea. Hmm, that depends a lot on what you want out of the finished photograph. 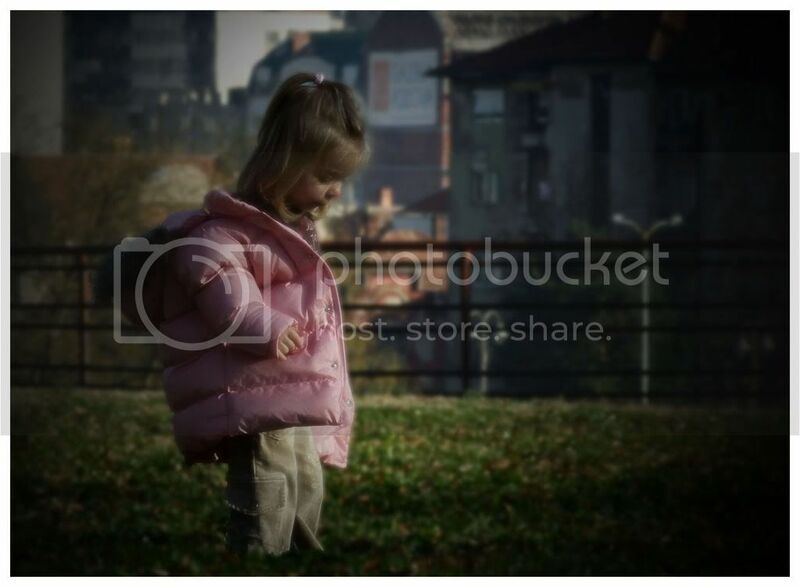 For me I a see a picture of a beautiful little girl walking in a park. I'm going to make her the focus of the picture, and since I like happy pictures I'm going to aim for bright and happy. If, on the other hand, you want to make a statement about a little girl in a dark cold world your original picture worked very well. I did pretty much the same thing I did in the first rework except I used a vertical format and didn't add the soft focus. The background ends up a little washed out but it's okay because SHE's the focus. The only other thing I might think about doing would be to use a little selective color to tone down the white block behind her head. What do you want this picture to convey?